$325 with 2 Therapist 2.5 hrs. $285 with 1 therapist 3 hrs. During your Day of Ayurvedic Rejuvenation you will receive Ayurvedic treatments based on your constitution. The purpose of these treatments is to profoundly relax the body and mind, improve the flow of energy by opening the channels of circulation, and to eliminate excess toxins (ama) on the physical, emotional, and spiritual levels. You can expect to be with us approximately 3 hours. This includes all of your treatments. A typical Day of Ayurvedic Rejuvenation session begins with an abhyanga, which is an Ayurvedic oil massage with 2 therapists working simultaneously, using specific oils and aromatherapy to balance your individual constitution. The practitioners will luxuriously massage warm oil into the tissues of the entire body, to help loosen and facilitate the removal of accumulated doshas (vata, pitta, and kapha) and ama (toxins) from the body. Marma Chikitsa is incorporated into your daily abhyanga. Pressure is applied to the vital healing points affecting the organs and subtle channels of the body. You will receive “Swedan”, a therapeutic sweat treatment, which is done in a steam box with essential oils to maximize the benefits of the massage. This dilates the channels of circulation, further loosening and removing impurities through the skin and gastrointestinal tract. 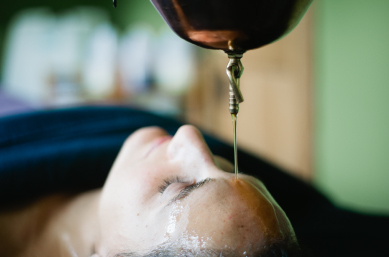 You will receive Shirodhara (often thought of as the Queen of all the Ayurvedic treatments), in which a stream of warm oil is continuously poured on the forehead for 30 minutes. This profoundly calms the mind and expands consciousness, thereby relaxing the entire physiology. Shirodhara activates the pituitary gland and can balance the hormonal system. In addition, this treatment has the added effect of awakening the third eye, enlivening the body and mind and stimulating cognitive memories.